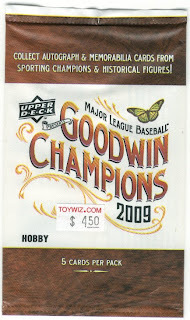 For those of you that follow me on Twitter you probably already know that I have been running around like a mad woman since Monday trying to locate packs or blasters of Goodwin. I was and still am hellbent on finding a blaster and will mow people down to get one (half kidding). Well, since Target had yeilded zero results I took myself to ToyWiz against all better judgement and sure enough they had them. They were in their display case so I had asked to see the packs so I could pick my own and count them. 18 packs were there. I am not going to go off on a tangent about this, draw your own conclusions. I did have a conversation with the owner/manager (not sure which) about why they are in the case along with some of the other higher end packs. He told me that they put those types of packs into the case so that customers can't search them. I can understand that completely, and it makes sense. I did mentiont that I have never seen a complete box in the case ever, always a pile of loose packs. I was assured the boxes are not searched, and I will take that information and pass it along to all of you in the local or not so local area. The conversation I had with the manager/owner was not in any sort of argumentative way. We spoke about the packs, and the storage of them and briefly discussed the pros and cons of buying online. He also mentioned a dislike for Beckett which may make the masses cheer and throw beers, but it was more of a $10 price tag that makes him not like it as well as the flimsy thinness of the pages recently. He didn't give me the impression that they sell many issues. More than pleased with the way the cards look. I love the design, and the colors are amazing. 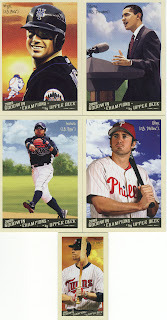 One thing I thought was kind of odd was that the David Wright card has Mr. Met in the lower corner. I wonder if that is some sort of variation, or that they are all like that. There is no Phillie Phanatic on the Chase Utley. I got a mini Robbie Cano card which made my day. 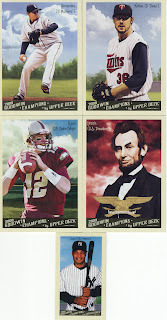 I am working on posting the results of my OPC hobby box... It may or may not happen, lol. I like the Mr. Met but he seems out of place on this card. Curious.